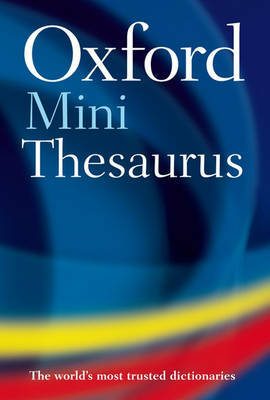 The Oxford Mini Thesaurus is a durable and affordable quick-reference thesaurus, small enough to carry around with you. It is great for use in word games and for everyday writing needs. The fourth edition of this Mini Thesaurus is a brand-new text with an ultra-clear design layout. It is based on the research of the Oxford English Corpus and includes thousands of example sentences to help you find the right word, and a new centre section providing quick reference lists ideal for puzzles and quizzes. The thesaurus includes 3 months' access* to Oxford's premium online dictionary and thesaurus service, Oxford Dictionaries Online, updated regularly with the latest developments to words and meanings, so you will have the most accurate picture of English available. Find out more about our living language using Oxford Dictionaries Online. Hear how words are spoken with thousands of audio pronunciations, and access over 1.9 million real English example sentences to see how words are used in context. Improve your confidence in writing with helpful grammar and punctuation guides, full thesaurus information, style and usage help, and much more. *Available in selected markets (UK, Europe, Australia, Canada, and South Africa). Terms and conditions apply; please see www.oxforddictionaries.com/access for information.